The Ever After High™ dolls are ready to turn over a fun page at the Book Party! At the iconic high school for the teenagers of famous fairytales, every event can be epic, and a high school celebration is no exception. Dressed for a page turning party, the fairytale teenagers wear dresses that mix book-inspired fashion with icons and details from the stories of their parents. Daughter of Wonderland’s Queen of Hearts, Lizzie Hearts™ tops the deck in a card-inspired print. Fableous accessories, like a book-detailed purse and card-inspired headband, complete the look. Collect all of the Ever After High™ dolls to have your own epic party or tell new tales with these favorite students (each sold separately, subject to availability). 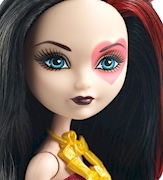 Includes Lizzie Hearts™ doll wearing fashion and accessories. Doll cannot stand alone. Colors and decorations may vary.